Saturday, Oct. 22 at 6:30 p.m.—RANDOLPH—A community music and dance party will be held on Oct. 22 from 6:30-10:30 p.m. at the Chandler Center for the Arts. This intergenerational social is the second of the “Live and Upstairs!” series of community engagement arts events to be hosted in the Upper Gallery. Dance callers Robin Russell and Martha Kent teach a variety of dances from the village cultural traditions of the British Isles, Ireland, Scotland and France. 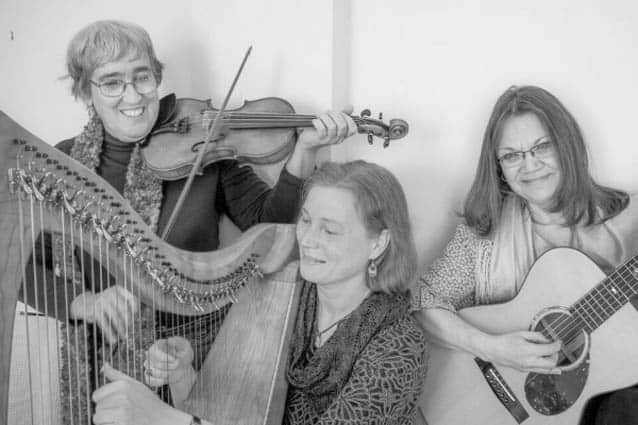 Traditional dance music is provided by Larks in the Attic (Susan Reid, fiddle; Linda Young, celtic harp; Pam Bockes, guitar). The evening’s activities feature early-bird facilitated music and dance workshops, live music, social dancing, food and a cash bar. Doors open at 6 p.m. for workshop participants (acoustic instruments only). Refreshment sales and general admission begins at 6:30 p.m. The band strikes up at 7:30 p.m. continuing until 10:30 p.m. Admission is on a sliding scale of $10-$15 per person; free for children under age 6. People of all ages are encouraged to come listen, learn, play and dance together. Community dances engage people to work together for common good, make personal and group discoveries, gain confidence through embodied learning, empower self-expression through repetition, develop body awareness and musical interpretation, and synchronize the creative energies of partnerships, small and whole-group sets. Spectators are welcome and encouraged to listen deeply for inspiration to tap feet, clap hands, sing-along or wiggle some shoulders. Chandler is located at 71-73 Main St., Randolph. For more info, visit chandler-arts.org. Larks in the Attic will perform traditional dance music at Chandler’s community music and dance party on Oct. 22.